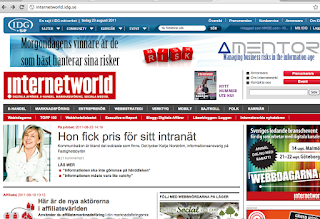 Nansens expertice within web and especially EPiServer CMS 6 intranets once again covers Swedens largest web/IT news site IDG InternetWorld. This time our favorite realtor Fastighetsbyrån talks Nansen, EPiServer intranets and the EPiServer Innovation Award they recently recieved for our work together. Don't miss it! Fastighetsbyråns recent work with Nansen was recenly also noticed by WebbSverige.